Goodman is a name that you have probably heard before, especially since it’s one of the leading brands of cooling and heating systems. 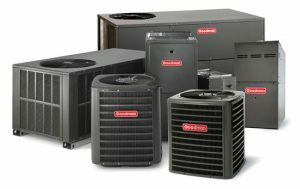 Goodman has been producing heating and cooling systems since 1982. Goodman units are very affordable and come with a warranty. Berico, Carolina Fuels and Alamance Oil can help you decide on the right Goodman system for you and also install it at your earliest convenience. Berico, Carolina Fuels and Alamance Oil offers service agreements to help you save money on maintenance and repairs of your Goodman system. The Goodman Company has been providing both air conditioning systems and heating equipment to its customers for the past three decades. With 30 years of experience, Goodman has been able to gain loyal customers who continuously do business with them. Goodman units are considered highly affordable, especially when compared to other similar systems. As a customer, you can appreciate the warranties that are offered to all customers by Goodman, to ensure customer satisfaction, which is their number one priority. There are several different products that are offered by the company and it is important to research what is available so that you can make the best decision for your home or office. Fortunately for those interested in Goodman systems, Berico, Carolina Fuels and Alamance Oil are able to provide you with advice on the best system for you. Once you choose the best Goodman air conditioner or heating system, our experienced technicians will install your system at a day and time that is convenient for you. One of our highly skilled technicians will come out to your home, explain exactly what is needed to be done before starting the installation process so you can be rest assured that everything is done correctly and in a timely fashion. When it comes to reliability, Berico, Carolina Fuels and Alamance Oil proves to be the leader Goodman dealer in Greensboro, High Point, Burlington and Eden. The professionals at these locations are fantastic at installing different products, especially those that come from the Goodman brand. However, these professionals do so much more than just the installation of the systems that you need for your home. If you have been looking for a company that also helps with the maintenance of your cooling or heating system, Berico is the best match. We take care of installation, maintenance, and repairs. If something goes wrong, we are there to assist and provide you our services to ensure that you can get that comfortable temperature of your home back without having to wait. We also offer service agreements to ensure you get the most for your money. We strive to go above and beyond all expectations to ensure our customers are happy with the service they receive. If you are considering buying a Goodman cooling or heating system, know that the professional technicians at Berico will be able to get the system installed in no time at all.